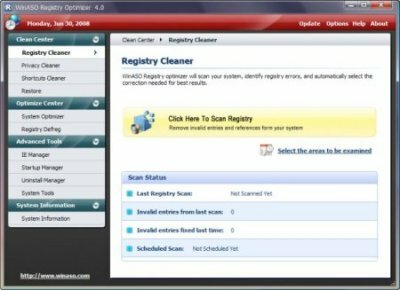 To scan your registry, first make the sections you want to scan by checking the boxes on the section list that correspond to the various sections of the Windows registry and Shortcuts. The default option is to scan all sections. To begin the scan, click on the "Scan" button. During the scanning process you can pause or cancel the scan at any time by clicking the appropriate button. 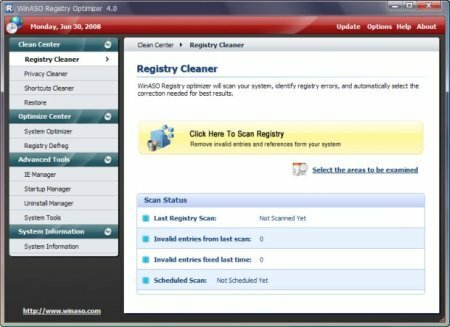 Once the scan is completed you will be shown a list of problems detected in your registry. You can either choose the entries to fix or choose the default to select them all. Then you click "Repair" to fix the problems. A backup copy of the repair will be automatically saved so that it can be undone if necessary.